Horses and nature were one of the main reasons why I decided to live in Costa Rica in 1999. My daughter Tara loves horses as well and grew up in Monteverde. Monteverde offers an ideal climate for horses. It is fresh and green all year round. For horseback riding, the local Campesino (country side) trails are the best, going through farmland & cloud forest, besides offering stunning views of the gulf of Nicoya, the Cloud Forest, coffee plantations, wild life and more. I love my horses and relate to them following the ideas of Mark Rashid and GaWaNi Pony Boy (a native American Indian from his book: Horse Follow Closely). Our horses are healthy and well taken care of. They are part of our families. I like to communicate my knowledge and love of horses with our riding guests. Riders learn about horses and riding, so you feel not only safe on the horse, but you feel it is your friend. When you treat a horse well it becomes your friend and likes to be with you. We attend all riding guests on arrival for a horseback riding briefing. Local guides will take you around the countryside. I enjoy helping beginners lose their fear of horses or riding as well as we love real horse talk. Give us a call, if you have more questions to set up a ride that suites your expertise. I speak fluent English, French, Spanish and German. I adapt the tours in the countryside and choose the horses according to their character and level of experience of the rider. We offer easy going horses for children, all of which are very safe and comfortable. Smallest children, in general below 3 years of age ride with their parents. Above we need to see the size of the child and we will take them in the lead until about 6 years of age. All riders wear riding helmets and get a briefing before the ride. The guides have years of experience in guiding. We also specialize in multi-day horseback riding vacations and full moon rides. I am very proud of all the positive comments riders have written in my guest book as it was that time, now you find comments online or by Volunteers that have stayed with me. I would be more than happy to have you read them or post one after your experience riding with us to help other guests decide to go riding. The basic rate is $ 25 US per hour, an average riding tour of 2 hours cost $ 45 US and 3 hours cost $ 70 US. 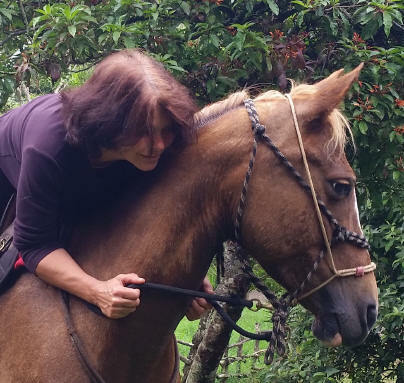 You can learn here not only about horseback riding and horse health care, but also about Costa Rica's many horse festivals.